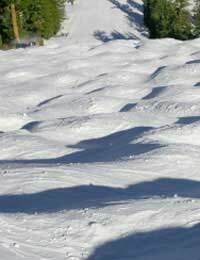 Like a field of land mines combined with snow-snakes ready to blow you up and take your skis, the mogul field before you shakes your confidence. The pro’s make it look easy, bouncing down the lumpy run, knees together, skis seemingly pointing straight down. But, looking down, everything we know about skiing seems to be gone. Like a mine field, having a map and being able to stick to it, makes getting through the moguls easy. That is why learning to bump ski actually begins on groomed runs, where we can practice the movements to retain our balance among the obstacles. Start with small radius turns down the fall line. Link your turns, keeping your hands, hips and eyes down the hill. All dynamic parallel motions apply, so remember to extend down the hill, release your edges as quickly as you can and finish your turns. Once your turns are even and you are able to keep your balance, practice your hockey stops. You should be tall and balanced over your feet when you stop, and should not slide forward or backwards, but stop completely. Your mogul tool bag also needs dynamic sideslipping. Slide down the hill with your skis pointing across the fall line. Maintain a straight line tilting your skis uphill to stop and then flattening them downhill to slide again. Move your weight forward and back to control your forward and rearward movement. Learning to pivot without the intimidation of moguls is important. Find a narrow groomed trail or have someone ski backwards in a wedge to draw a narrow corridor in the snow. Pretend you are on the top of a very narrow plateau and on either side is a hundred foot cliff wall to a rock quarry below. Do not slide off the imaginary edge. Flatten your skis, plant your pole down hill at your foot, and pivot 180º making a completely non-edged turn, tilting your skis again to stop. Utilize flexion and extension to allow you to keep your skis flat while pivoting them. Practice connecting your pivot turns until you can do them the whole length of the imaginary plateau quickly and smoothly without falling off. Once you can comfortably make balanced pivot turns and sideslips, it is time to think about body angles. In warmer climates people hunt frogs with sharp poles at night (frog legs are a delicacy you know); in the American Deep South it’s called frog giggin’. A similar movement will help you tame the moguls. First in your sideslip position, turn your hips to face down hill. Then put your hands in front of you. Pretend your downhill pole is the sharp giggin’ stick, and the top of the handle of the other pole is the flashlight. The stick stabs the frog, or top of the mogul, while the flashlight points to it (tuck the length of the pole along your side). After a pivot turn, the hands switch, so the new downhill hand is the stick and the other is the flashlight. Practice a few pivot turns while giggin’ on groomed terrain. Then move to an easy mogul run. Do not let the bumps intimidate you; they are only mounds of snow! Remember to keep your hands up, and hips downhill. Start by choosing a line of bumps that takes you down the hill, not across. Try to look three bumps ahead at all times, ski to the first bump pole out. Turn shape matters in bumps as much as on groomers, so remember your 45’s. Stab the top of the mound and pivot into the fall line down the side of the bump, finishing in a hockey stop between bumps with your hands up and hips still facing downhill. Letting your hand linger behind you will throw off your balance and make you loose control. Keep your hands up! Stab the new bump and pivot around, linking turns while looking ahead to the new bump. Check your speed with skidded hockey stop motions and J-turn shape finishes. You’re bump skiing! As you pick up speed, remember turn shape for control and balance for everything! Dropping your hands drops your balance. Relax and get a rhythm in your head; go for it!